Do you know where your friends are? If not, Google wants to help you find them. Today, Google introduced Latitude, a new opt-in feature that lets smartphone and laptop users share their location with friends and allows those friends to share their locations in return. Although not pinpoint accurate, Latitude can display your general location based on information from GPS satellites and cell towers. Latitude works on both mobile devices and personal computers. 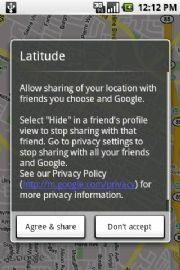 Once you and your friends have opted in to Latitude, you can see your friends' Google icon displayed on Google Maps. Clicking on their icon allows you to call, email or IM them, and you can even use the directions feature on Google Maps to help you get to their location. Let's say Bob wants to share his location with his girlfriend Jane. 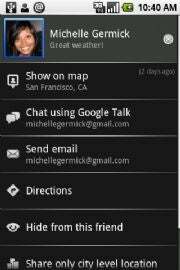 He invites her to accept his invitation through his mobile device or computer. Then Jane can accept and share her location back; accept but not share her location; or completely reject poor Bob. If Jane has chosen to share her location with Bob, she can decide whether to share her best available location or simply which city she's in. Jane could also hide her location to keep ol' Bob in the dark from time to time, or if Jane breaks up with Bob for her neighbor Richard, then she could just remove Bob from her location list altogether. In addition to restricting specific people, Latitude will also let you do a blanket location setting for all your contacts. You can choose to let Latitude detect your location automatically, you can also set it manually if you prefer or you can hide your location completely. According to company statements, Google only keeps your most recent shared location on its servers at any time. If you've hidden your location, then Google doesn't hold any information on your locale at all. While this feature sounds like it could be helpful, and sometimes incredibly annoying, I wonder what this does to the notion of privacy. For example, will federal officials or the police ever try to force Google to relay your location information? Where you are can also say a lot about you especially when it comes to your free time. Google could easily build a demographic chart to show where certain age groups like to congregate in a particular city. I hope this is not the case, but questions about Google's privacy practices have been raised many, many, many, many times before. If you're opting in to Google Latitude, then check out the video in this post for a brief introduction to Google's Latitude service. Then go to http://google.com/latitude to sign up.